These days, a lot of things come up when talking about turkey decoys. First on the list is the great decoy debate, why you should use them and why you shouldn’t. Next is what style, then what texture. Should you use mounted decoys? What about foam decoys? Inflatable or hard body? The discussion continues with what time of year certain decoys should be used and whether you should use jakes, hens, feeders or breeders. If you’re going to use them, you should know how to setup decoys during a hunting situation in order to be the most effective, as all is really for naught if you do not set them up properly. When it comes to decoys, I believe that using them is a great weapon when trying to fool wily old toms. Like a PowerPoint to a speech, a good visual is essential to completing your setup when trying to close the deal. It’s easy for me to say that simply using decoys is a plus, but how to use them is the most important thing. As all turkey hunters know, or will soon figure out, turkeys have excellent eye sight. This is the key to the good and bad sides of decoy setups. The fact that they can see so good is advantageous in luring a tom in from his position. It is also the main reason more turkey hunters are picked off every spring while using decoys, thanks in part to hunters placing the decoy(s) directly in between them and the bird they are hunting. Unless, you are using a ground blind, or have the optimum amount of cover in front of you, which is a small percentage of the time given the nature of run and gun style turkey hunting, placing a decoy directly between you and an old gobbler is not the best idea. 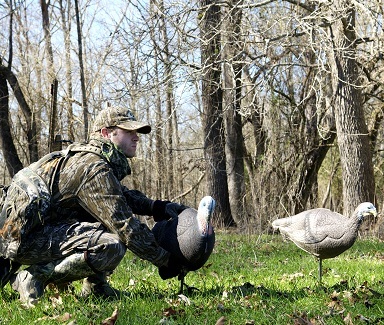 You’ve heard the term “locked in” time and again about gobblers coming to decoys. This is true; a gobbler being locked in on a decoy is the desired reaction we all want from him. But when he locks in, and you are sitting directly behind his point of focus, it can be a dangerous situation. There is already little room for error when trying to move with a turkey in view, and when he is staring directly in your direction, that margin of error shrinks. You run a high risk of being busted unless you can shoot him when you first see him, or you are completely motionless during his approach. The fact of the matter is, if you have time to setup a decoy in the first place, you have time to position yourself accordingly. Setting the decoy(s) up directly in front of you can be very effective when a bird is working from the side of your position. Setup facing the decoy(s) and when the bird enters from the left or right of the setup, you are completely out of his sight. If the situation calls for the decoy(s) to be placed between you and the bird you’re hunting, you can easily set the decoy(s) up in front and to the left or right of your position. This way, when the gobbler gets in sight of the setup, you are not the backdrop of his view. Assuming the decoy(s) are within gun range of you, the gobbler will parade to the setup and you will be a trigger squeeze away from pulling it off. He won’t even know you’re in the world. Another setup involves placing the decoy(s) behind your location. If you suspect that the bird you are hunting may hang up on your decoy(s), then this is ideal. Placing the decoy(s) behind you and to the left or right will bring the bird closer to your barrel if he does decide to hang up on your decoy(s). This situation is very similar to a caller being farther behind the shooter in order to coax a bird in close enough for a shot. A big mistake hunters make is placing a decoy directly around them or hiding behind it just to have a decoy out. This is a resounding NO. The main reason is that if you are on public land or another hunter is present in your location, a hunter can easily mistake the decoy for his prey and that leaves you in the line of fire. Another reason is that, just like having a decoy setup directly between you and the bird is a bad idea, a turkey will probably spot you as soon as he lays eyes on the decoy. I can highly advise to NEVER, under any circumstances, place a decoy in your immediate area. You don’t have to use decoys to kill turkeys. It does help, and even though I use them religiously, I get more pride out of bagging a bird without them. With all that aside, if you are going to use them and you have time to place them, make sure you are using them correctly and especially in a manner that won’t mess up your hunt or put you in danger. Trust me; you would rather put that decoy back in your vest than end up ruining your day by hastily placing it in a hunt-threatening position.